Another location with plenty written about previous structures but with little information on the current bridge. The Passerelle Palais de Justice sits in front of the Cour d'Appel de Lyon. 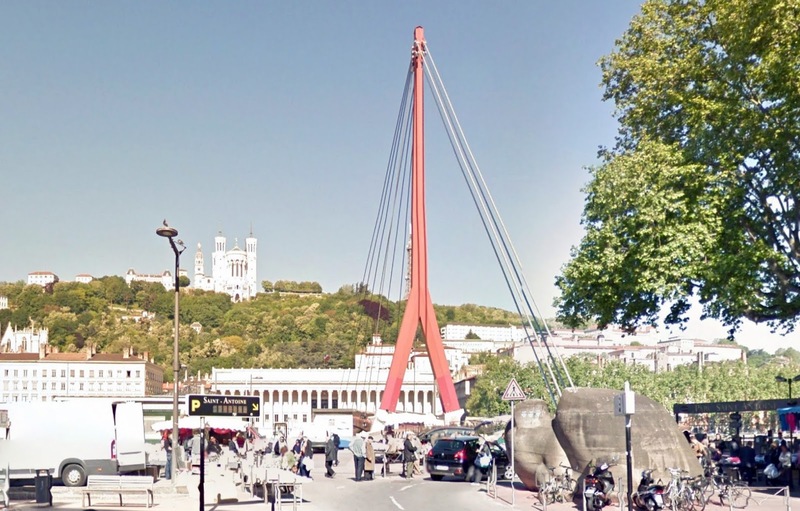 It's a cable-stayed footbridge with a single tower near the left bank of the river. I wish I could have found more information about this bridge because of its odd details. For instance, a cable-stayed bridge with an eccentric single tower will have the cables behind the tower buried underground. However, this bridge has the cables anchored in what I assume is a sculpture (see photo below). Speaking of sculptures, there is a statue at the other end of the bridge, in front of the court (see photo below). I assumed this sculpture depicted a hero from Greek mythology, until I found out that it's actually called 'The Weight of Oneself.' Well, I guess it's oneself as long as one is a young white man. The artists are Michael Elmgreen and Ingar Dragset and their sculpture was unveiled by the mayor of Lyon in 2013. Returning to the bridge, the Passerelle Palais de Justice was designed by Gilbert Lamboley with architectural assistance from Charles Delfante and built by Baudin-Chateayneuf in 1983, according to the Structurae Website. The bridge is 136m (450 ft) long, only 4m (13 ft) wide, and with a tower on split legs that straddles the deck. Despite the artistic paraphernalia that surrounds the bridge, I don't find it to be a very attractive structure. The tower looks puny on the big concrete foundation and the deck is unimpressive. I think it could have been a very dramatic structure if it was supported by an monolithic tower rising out of the water and if the deck was an elegant line stretching between the banks. Certainly the stately buildings that surround it are begging for a more dramatic statement across the river.